It has been cheering to read recent positive feedback about the proposed grand waterfront hotel situated off Dunedin’s premiere fishing wharf, henceforth to be known as the Palm Lagoon Precinct. The trouble with our small city is the overwhelming negativity we have towards ambitious projects proposed by visionary thinkers. After reading yet another glowing report about the hotel in today’s Otago Daily Times, I quickly whipped out an old pie packet from under my desk and scratched some equations of my own with a blunt pencil. My own calculations prove beyond reasonable doubt that Dunedin could benefit $200 million, or it might have been $400 million, from this development. I used the same method to calculate it as we did with the stadium profitability projections. As long as you just keep adding any stray numbers together, and stick to round figures in multiples of ten million, you can come up with an impressive figure in no time at all. I call it positive accounting. In order to maximize the cash windfall, we will need to investigate the location of the hotel to make the most of local weather conditions. If we place the hotel at the end of the rainbow, we will all benefit from the pot of gold. The only way forward is to learn from the go ahead attitude to economic development shown by other successful small nations. 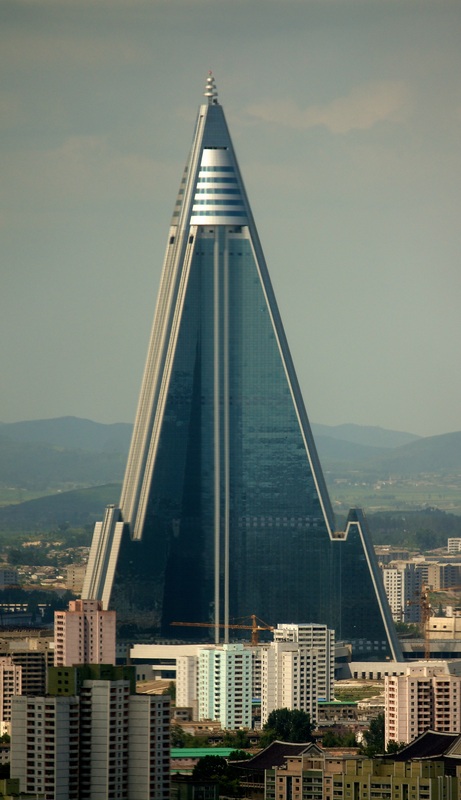 The Ryugyong Hotel in Pyongyang provides an excellent template for what can be achieved when negative attitudes are overcome. With a height of 330 metres, the visionary Ryugyong Hotel was originally intended to have five revolving restaurants and either 3,000 or 7,665 guest rooms. Construction began in 1987 but was halted in 1992 due to the end of the Cold War and general economic crisis. However after a brief interlude of sixteen years, construction resumed in 2008. It is expected the landmark hotel will open as early as next year. In the intervening sixteen years, the half finished skeleton added innovative architectural features to the skyline of North Korea’s capital. Eye-catching diagonal spikes and robust concrete features towered above the dilapidated apartments of the impoverished citizens, and encouraged them to ever greater heights of economic progress and positive thinking. There is of course a small risk that our new hotel in Dunedin could turn into a local manifestation of the Chinese phenomenon of “ghost cities,” a result of bold infrastructure investment where visionary concepts have outpaced dull reality. The BBC reported earlier this year about the ghost city of Chenggong. “High-rise apartment blocks have mushroomed but today it is still largely deserted after failed attempts by the authorities to attract new residents,” says the BBC. The World Bank reports that there are more than 100,000 new apartments with no occupants in Chenggong. Dunedin has a long way to catch up with this kind of global best practice. So far we only have the empty suburbs and the stadium. We need to finish some buildings, so they can be abandoned, otherwise we will risk looking obsolete. Perhaps we could establish a sister city relationship with Chenggong. We could show them how to deal with empty stadiums. Ours cost too much, obviously, and following the Elton John gig and a few football matches, the joint is deserted. But we adjusted to our ghost stadium. On top of this master plan, the community to its pleasant surprise has now invested $750,000 a year extra to subsidize community events in the stadium. This is an innovative financial technique known as sub-subsidization, where you subsidize a subsidy. In the case of multi-storey hotels built on reclaimed harbourside mud, we could take it to the next level and have subsiding sub-subsidization. There is no shortage of innovative thinking in our city and I believe there are options here for public private partnerships with the hotel entrepreneurs. We could reserve the top floor penthouse suite for the new offices of the combined City and Regional Councils. We could find a local accounting or law firm to contribute a modest amount of funds (perhaps 1% of the total bill) and then name the hotel in their honour, including a flashing neon sign on top of the revolving restaurant. A matching tollbooth installed on the nearby railway bridge would recoup roadwork costs. Visiting acts at the stadium could be accommodated in the hotel as part of the incentive programme funded by eager ratepayers. We could name this the “Cowboys and Clowns” Dedicated Fund in honour of the two remaining entertainments at the stadium these days, rodeos and circuses. In the case of rodeos, any associated beasts could be corralled in the car park, and herded up the road for performances. Some effort would have to be made to separate the circus staff from the Council chambers, but with some forward thinking and high level discussions between Councillors and the Ringmaster this could be achieved. On the basement level, therapeutic hot mud pools could be established that take advantage of unique feature of rising sea levels and reclaimed foreshore. With the victory of positive thinking and the construction of the Dunedin Palm Lagoon Luxury Resort, we face a bright future. This article appeared in the Otago Daily Times on 14 December 2012.